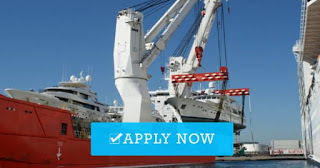 SEAMAN JOB INFO - Posted/Feb/2019 Sealanes Marine Services, Inc. hiring Filipino seafarers crew join on general cargo ship rank position ratings. With a minimum of 24 months experience as Cook/AB or OS/Cook onboard conventional vessels or offshore vessels. Experienced Chief Cook with hands-on knowledge in deck duties are welcome to apply. With TESDA NC III and CoP II/4. With valid training certificates and COP. With a minimum 24 months, Ordinary Seaman experiences onboard conventional vessels (International trade). Holder of valid Liberia & Panama SB is an advantage. Priority is those with valid or expired Schengen Visa. Holder of Reg II/4 from Marina. With valid STCW training certificates and COP. recruitment@sealanes.com.ph / 09285509671 / 09663881554. 0 Response to "Ordinary Seaman, Able Seaman, Cook, For Cargo Ships"